Linking Africa's vast south with the north, around awe-inspiring mountain ranges that dot the continent, over untamed savannah grasslands and through arid desert landscapes, the Blue Train provides an unforgettable experience for all. 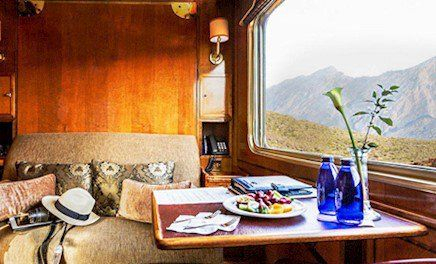 Capturing magnificent views from a new vantage point, the Blue Train provides unmatched experience of luxurious modern travel, and yet invoked the romance and history of its glittered past. Choosing your adventure is often the hardest part! 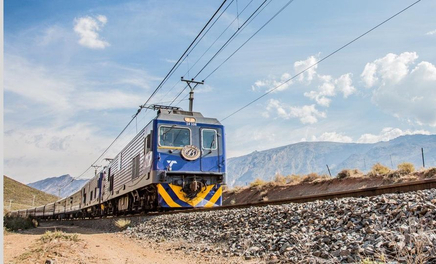 View our Blue Train offers here. An elegant and relaxing lounge during the day, transforming into a subtly lit bedroom of indulgence during the night. 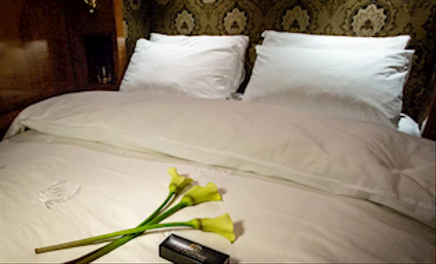 De Luxe Suites are decked with cotton bedding, individually controlled air conditioning systems, under floor heating, opulent marble and a gold fitted bathroom. And then of course... the magnificent, ever changing views of the African countryside through your window. The Blue Train offers two convivial spaces in which to build friendships over a beverage of choice. The Club Car, ideally situated behind the train’s engines offers the feel of a burnished, wood-panelled gentleman’s club where you are free to enjoy a Cuban cigar which we serve after dinner to round off a perfect evening. Whether you’re after a game of backgammon, chess or cards, the lure of the big screen or a tome from the library’s selection, a fascinating chat with the barman or simply a solitary reverie of the star-lit skies, then the Club Car is your ideal setting.